I to am running repo STD`s . Yes, I just came to this site in December, and know that I might be a little late, but it is my two cents worth for now.! I agree completely about pointless oil coolers (unless you are planning a long, severe run across a desert at the wrong time of year, during daylight hours, pulling a hack and pushing two windshields). "I personally sold off my '49 heads and bought STD ones. I got more cash for the '49 heads than I paid for the STD ones." You shoulda been able to buy two, maybe three sets, if the originals were in excellent shape. Originals will continue to appreciate, particularly since this two-year issue is constantly being destroyed by believers in the "hardened seats" myth. Your catalog order heads depreciated as soon as you opened the box. This is just a fact of life that has nothing to do with performance. NOTHING, I say NOTHING about this '49 was excellent when I got it. It was pretty used up to begin with and then went through a fire. I have a great respect for original machinery, but this definatelly needed a chop job to get on the road again. Yes, the STD heads run cooler but we forget that the sewer pipe ports and shovelhead valves do some of the extra cooling also. Then again, if the front wheel is REALLY out there, it won't disrupt air flow at all and will run even cooler. Keep those old dogs barking!! Well stop and think about it for a minute!!! you have (stock) oil lines going through the cylinders allowing oil to reach the rocker arms....very hot oil!!! just how much lubricity does that hot oil have when going through those very hot cylinders?? The way to determine if your dropping the temp with out side oilers is to have recorded the temp of both cylinders while that bike was at normal operating temps. with an infra red hand held temp gun(less than 100$ at most auto tool shops) then when the switch over to top oil lines is done do another reading!!! I,ll bet you,ll be surprised!! Even harley(finally) went to out side oilers in 1963!!! In my search for a set of Panhead heads to get my bike running I came across a set which had been machined for outside oiler this way. The heads have also been welded an machined for evo exhaust. Would these changes depriciate their value significantly? 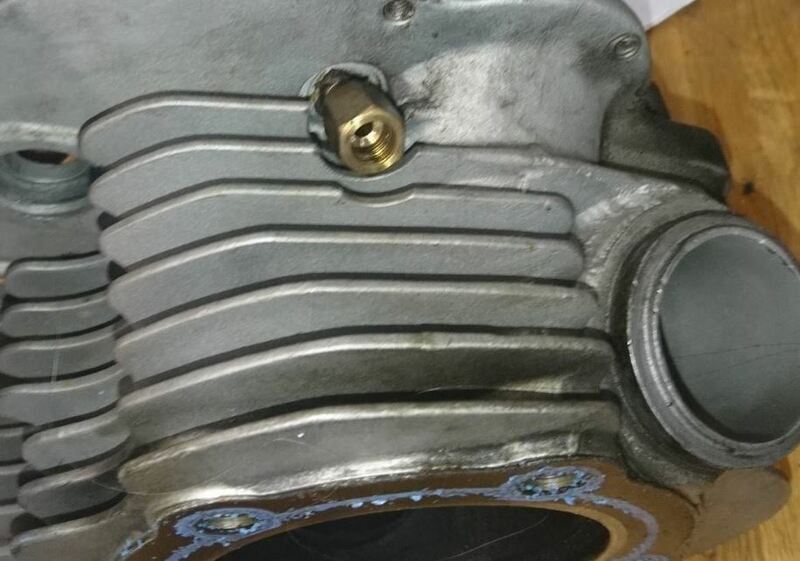 Perhaps a good harley restorer can atleast weld up the outside oil port and remachine it. They otherwise look good. No cracks according to seller.